As you will discover, the Holliger Chiropractic office is professional and fun. We offer affordable, convenient , and effective treatment in a relaxed and comfortable atmosphere. Schedule an appointment, or just walk in, and we will help you get rid of your pain fast. With an Xray machine on site, and expert answers to your questions, you can usually skip a trip to the emergency room! Dr. Maria Holliger, B.S., D.C.
Hello, I am Dr. Maria Holliger. I received my Bachelor of Science and Doctor of Chiropractic degrees from Palmer College of Chiropractic in 1986. 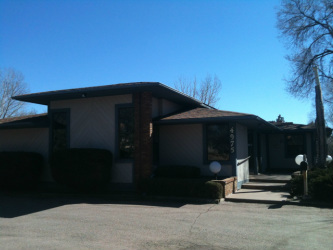 In 1987, I accomplished my goals of becoming a licensed Chiropractor and calling Colorado Springs home. I opened my own practice in 1989 because I wanted an office that reflected my compassion for people and my desire to help you reach your goals quickly. I enjoy working one-on-one with my patients to help them meet their goals for pain relief and better health. Chiropractic treatment has achieved amazing results: helping herniated discs heal, relieving headaches, eliminating lower back pain, I could go on and on. The added benefit of teaching patients about good nutrition with food and correct supplementation has been very rewarding for patients and doctor alike. I look forward to our time together. I first met Dr. Maria Holliger when I was 17 years old. I was injured in a car accident, and she treated me for dizziness, fainting and neck stiffness. I was also having trouble sleeping. After just a few treatments, I was feeling much better and before I knew it, I was symptom-free. My parents had seen her before and felt better fast, too. Then, in 2006, I became her Chiropractic Assistant. She has taught me so much about Chiropractic treatment, nutrition, and taking the RIGHT supplements! I feel lucky to work with her & help our patients . I know my son is having a happier and healthier childhood with the treatments that he gets at our office. Growing pains, running, wrestling, and just being a a boy are all more fun and less painful with the care he receives from Dr. Maria. My family and I are very fortunate to to have Dr. Maria in our lives! The Holliger Chiropractic office is unique. This converted home at 4975 Austin Bluffs Parkway in the Old Farm neighborhood is the perfect place for comfortable, friendly, relaxing pain relief. We offer complete Chiropractic care for all ages. We especially enjoy diminishing or eliminating migraines or other headaches, healing most herniated discs without drugs or surgery, and helping couples that think they are infertile achieve their dreams! Whatever your ailment or question, call us first for professional advice and honest answers. If we can't help you, we will find someone who can. One of our patients' favorite things are the "roller tables." Technically, they are Intersegmental Traction tables. Enjoy some time on this relaxing and therapeutic table! While lying down, the rollers within the table move up and down your spine: increasing motion, flexibility, and circulation while decreasing muscle knots, spasms, and pain. Our office also uses a flexion-distraction table. Used manually by the Chiropractor, this table helps decompress the lower back, creating a little traction that enables discs and bones to return to normal position, restoring motion and decreasing pain without the cost of pricey "spinal decompression" treatments. Call us first for your disc problems, or if surgery has been recommended. We may be able to help you without the use of drugs or surgery.